﻿ "We All Played J.F. 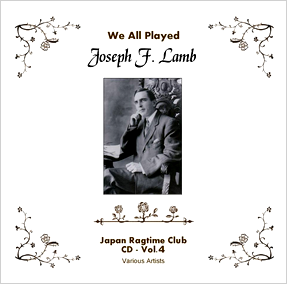 Lamb" - Memorable CD by Japan Ragtime Club. Many thanks to all who play in CD and who help and support to release, especially Ms. Patricia Lamb Conn - allowed to use the official picture of her father. It's been a couple of years since the beginning of this plan to make a memorable CD of Joseph F. Lamb - 1 of GREATest 3 of Classic Ragtime Composers. There might be various reasons to tribute him, for example, inspired by the release of the bio-book "J. F. Lamb - A Passion for Ragtime", or to let his name known more and more here in Japan... however, the most important one is ALL we love him & his rags, and play every time and day... by Piano - moreover, by Guitar! We all hope you enjoy this CD, as we enjoy to play - and just like the composer himself had been enjoying ragtime music for all over his life in the last 20th century. Celebrating the release of CD, we hold a commemorative event in Kyoto "Ragtime Party for every fan". More info. of PDF-Flyer by CLICK the bunner-link below! ; sorry in Japanese language. *Only Beer with extra fee.